Department of Otorhinolaryngology–Head and Neck Surgery, Seoul National University College of Medicine, Seoul, South Korea. Recently, there has been a steady increase in costal cartilage usage in rhinoplasty. For a long time, many have been critical of its use for its potential associated complications. However, criticisms aside, costal cartilage makes for an excellent source of graft due to its extremely durability, versatility, and functionality. 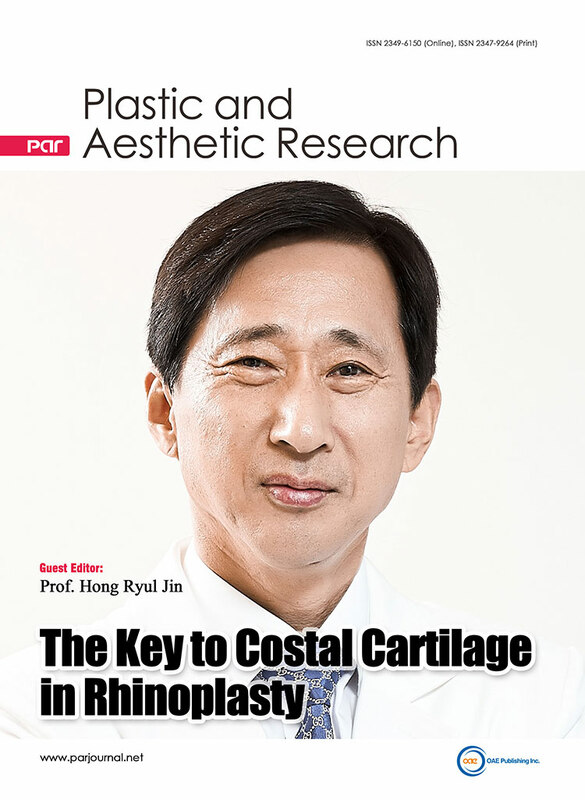 In this special issue, world-renowned experts discuss almost every aspect of costal cartilage usage in rhinoplasty; from harvesting and carving to clinical applications and management of complications. Veterans in the filed of rhinoplasty, the authors share in great detail invaluable knowledge that can only be attained through extensive clinical exposure and utmost effort towards innovation and mastery of their craft. I am confident that this special issue will provide meaningful insight into the usage of costal cartilage in rhinoplasty. Furthermore, it is my very hope that readers will be able to integrate these cutting-edge knowledge into their practice. 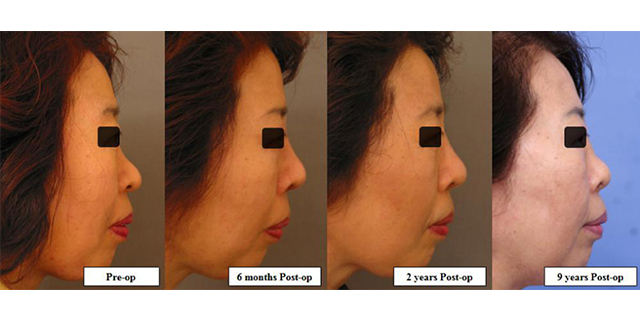 Asian rhinoplasty is a very common cosmetic procedure. Many Asians desire a higher nasal bridge, for which they undergo several procedures, including filler injections, implantations and insertion of threads. Surgeons encounter many patients who have had several procedures done on them previously. In this paper, we introduce the use of autologous grafts for Asian rhinoplasty (primary and secondary), and discuss the rib carving techniques and difficulties encountered during harvesting, carving and placements of grafts and how to overcome these problems and prevent complications. Rib cartilage is the most reliable material for structural support and dorsal augmentation in Asian rhinoplasty with its robust strength and bountiful amount. Its value is incomparable especially in complex, cartilage-depleted revision surgery or major reconstruction. There are many articles regarding harvesting and carving of rib cartilage in rhinoplasty, however, only few has focused on preoperative and postoperative issues. Preoperatively, evaluating cartilage availability, assessing quality and quantity of cartilage, and choosing the cartilage to harvest are necessary. Although easily overlooked, proper postoperative management of rib cartilage rhinoplasty patients is key to prevent infection and heighten patient satisfaction. Here in, I would like to introduce how I evaluate rib cartilage rhinoplasty patients preoperatively and manage them postoperatively to maximize the surgical results. 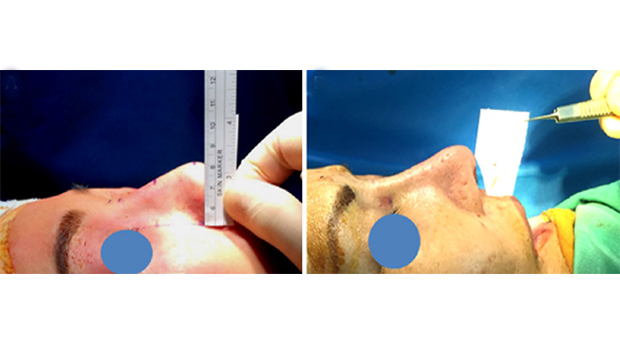 The aim of this paper is to discuss an updated technique for dorsal augmentation during rhinoplasty using diced cartilage wrapped in fascia. The usage of diced cartilage has been variously described in the literature with consistently satisfactory results. Herein, we present our experience with patients undergoing dorsal augmentation during rhinoplasty using an updated method of diced cartilage wrapped in fascia. Diced cartilage fascia techniques have become the technique of choice for dorsal augmentation for an ever-increasing number of rhinoplasty surgeons. The term is broadly descriptive and there remains a wide-range of ways to execute. Updating and enhancing the technique with greater attention to precision, and creating an aesthetically optimal and predictable result, may result in even improved outcomes for future patients. A considerable part of revision rhinoplasty in Asians is associated with problems arising from the use of alloplastic implants. Revising alloplast associated problems of the nose mostly requires the use pf autogenous grafting material to minimize complications and maximize favorable outcomes. Although remnant septal cartilage and/or conchal cartilage can be used, as the deformity becomes more severe, adequate revision requires more volume and strength of grafting materials. Autogenous rib cartilage may be the most practical choice in these circumstances. 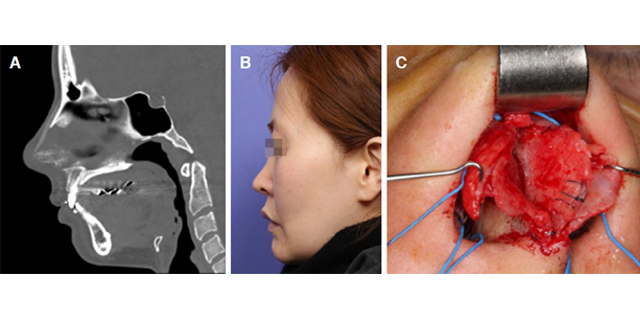 In this review, common causes of revision rhinoplasty in Asians are discussed together with operative techniques with emphasis on the use of autologous rib cartilage. Aim: To assess the safety profile and practice trend of autologous costal cartilage harvest by facial plastic surgeons in the United States (US). Methods: A 10-question online survey was distributed by the American Academy of Facial Plastic and Reconstructive Surgery to its members. Results: Of the 2,639 members, 2,379 received the survey with 137 (5.76%) members responded. The majority (33.6%) of the respondents were expert facial plastic surgeons. 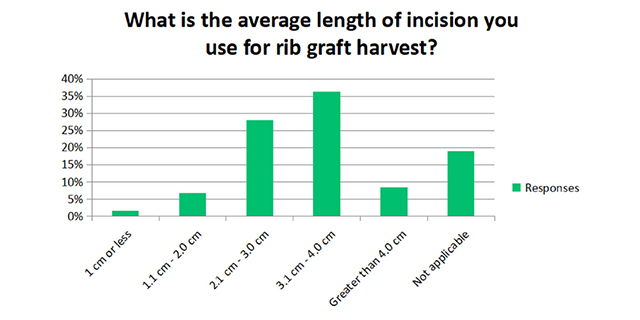 One hundred and nine (79.6%) of the respondents performed rib harvest with 49.6% of them performing the procedure at a hospital facility. Among them, 21.5% exclusively performed their surgery at an ambulatory surgical center not physically attached to a hospital while 6.67% of them at the in-office accredited operating room. When comparing techniques, 64.7% performed only full-thickness rib grafts vs. 12.0% harvesting partial-thickness rib grafts. Most used an incision length between 2.1 and 4 cm (64.4%) while 2 surgeons used < 1 cm incision. The occurrence of pneumothorax after autologous rib harvest remained low (< 1%) in most (73.1%). Regarding safety practices of the surgeons, only 24.6% would order a chest X-ray post-operatively while 54.5% would not. In addition, 58.7% of respondents never kept their patients overnight for observation after autologous rib grafting while 15.0% always would. For pain management, most respondents (50.4%) did not utilize any additional analgesia protocol besides oral pain medications. Conclusion: Two thirds of the US facial plastic surgeons performed autologous costal cartilage harvest in a hospital setting. 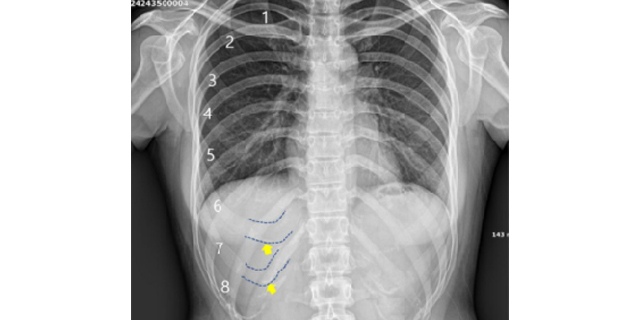 Routine chest imaging or overnight observation post-operatively was not warranted as the percentage of pneumothorax remained low and pain control was adequate. This review specifically addresses the use of homologous costal cartilage in rhinoplasty with a particular focus on the related complications that can be encountered. It is important to stress that autologous cartilage is probably the preferred material for grafting in rhinoplasty. However, concerns of donor-site morbidity and extensive surgery have motivated the development and use of homologous costal cartilage. Because homologous costal cartilage is readily available, it has been widely used as an alternative to autologous costal cartilage when restoring nasal contour. Both favorable and unfavorable reports can be found in the literature, however, controversy still exists regarding the complications that can occur with using homologous cartilage as a graft material in rhinoplasty. Therefore, the aim of this review is to summarize the current understanding of the usefulness and the problems related with the use of homologous costal cartilage in rhinoplasty.